What quality is more reviled in contemporary literature than sentimentality? Its detractors have a good argument: Fiction that succumbs to mawkishness often presents a view of the world that is at odds with reality and is thus unsatisfying or unbelievable. Not every portrait of tender emotion is as dreadful as all that, of course. You can get away with promulgating any worldview you want if your story has dramatic tension and nuanced characters. But when drama and nuance are missing, the result is no different from crime thrillers in which the good guys are saints and the villains are pure evil: a caricature that bears little resemblance to anything but life’s outliers. 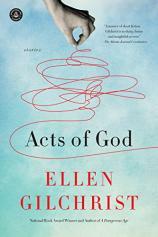 Such is the case, alas, with many of the stories in ACTS OF GOD, Ellen Gilchrist’s first collection of short fiction since 2005. There’s little variation in the 10 works in this volume. Almost every story is about privileged white people in the American South. The characters are good-hearted people who try to live honorable lives and who struggle to respond with equanimity to events such as Hurricane Katrina and airport lockdowns. But Gilchrist gives us stark contrasts rather than shading and undermines opportunities for conflict with hasty and simplistic resolutions. The title story is one of the best. Will and Amelie McCamey are 86 and have been married for 70 years. As they can no longer care for themselves, a sitter comes to their Madison, Georgia, home each day to help them. One day, the sitter calls and says she’s going to be late. Will and Amelie take advantage of their caregiver’s absence to drive to the new Winn-Dixie and buy groceries, only to get into an accident on the drive home. "Almost every story is about privileged white people in the American South. The characters are good-hearted people who try to live honorable lives and who struggle to respond with equanimity to events such as Hurricane Katrina and airport lockdowns." Up to this point, Gilchrist masterfully uses quick strokes to give us a vivid portrait of the McCameys, their many children and grandchildren, the town’s biggest developer, and the couple’s caregiver. But the ending is an example of where the book goes awry. Rather than give us a nuanced portrait of the effect Will and Amelie’s accident has on friends and family, she has Walker, their youngest son, compose “a list of all the people he was related to who were still alive as of September 11, 2005,” and vow to teach others to think about the goodness of life. That’s a noble goal, but it doesn’t make for compelling reading. Other stories are similarly handicapped. The first half of “Miracle in Adkins, Arkansas” is a powerful depiction of the attempt to rescue victims and bring emergency supplies purchased at Walmart to a town devastated by a tornado, but the second half portrays a young rescuer’s determination to be nicer to everyone, even her older sister, who leaves her clothes all over their shared bedroom. In “Collateral,” an accounting teacher who is a National Guard first responder brings emergency supplies purchased at Walmart to New Orleans after the city is devastated by Katrina. 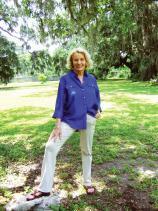 Upon her return, she falls in love with a fellow divorced parent who “began to remember the heaven that men and women could sometimes give to one another.” In “High Water,” two gay paramedics from Los Angeles are vacationing in New Orleans when Katrina hits. The story has compelling moments but becomes too simplistic when it juxtaposes the heroism of first responders to the pettiness of a wealthy gay resident’s vindictive ex-wife and former mother-in-law. Two stories offer welcome variation from the other pieces. “The Dogs” is a delightfully vicious epistolary tale in which recurring Gilchrist character Rhoda Manning and some of her neighbors complain about a new resident’s barking hounds. And in “Hopedale: A History in Four Acts,” a white family in 1901 Mississippi allows an eight-year-old African-American boy to live with them after his family is forced to escape the floods that ravaged their town. But most of ACTS OF GOD is too sketchy and sweet, the stories are too similar to one another, and they contain too many sentences like, “She squeezed my hand and we went back to writing on our postcards and eating croissants and being here, glad to be alive in the only world there is, alive and eating and still breathing and not afraid really of anything that might happen next.” More variety and a harder edge would have made sentiments like these feel more real.